Old toys rarely get a second chance for a new life. Most of them head to landfill without a second glance. But Jose Gomez-Marquez of MIT has come up with a way to hack old toys into medical devices for dealing with everything from diabetes to dengue fever, providing cheap solutions for developing nations all while reusing existing products. What Gomez-Marquez and his team are coming up with is nothing short of amazing. He’s developed a bike pump-powered nebulizer for asthma patients, and a printer that can diagnose diseases which can then be uploaded to a central database via mobile phone to track the spread of infectious disease. They’ve also developed a lab-on-a-chip created using Lego bricks as molds, reducing the cost from needing materials made on a $500,000 machine to materials that run about $10. Being able to hook an old bike pump up to power a device that will bring relief to those suffering with asthma or diagnose a disease with a printout from an old inkjet — it is upcycling and reuse at its very, very best. The ingenuity doesn’t stop with his work at MIT as program director for MIT’s Innovations in International Health initiative. The program wants to train other medical professionals to use the creative half of their brain and hack devices with ordinary objects they find around them. Check out TreeHugger for 30+ fresh, green stories every day! 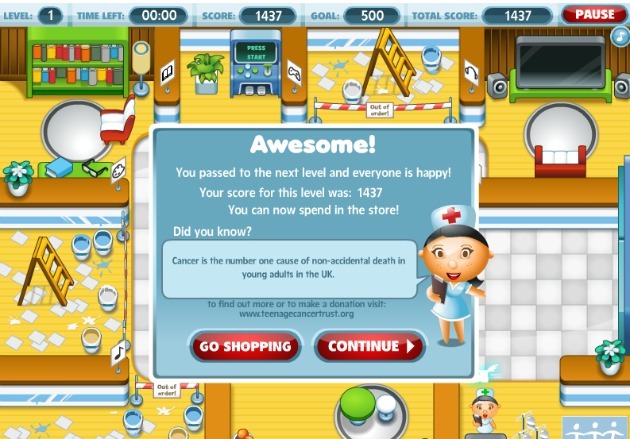 Miniclip and Teenage Cancer Trust have designed a game that turns a difficult subject into a fun and fresh experience. The game, called “Funky Nurse,” is short but surprisingly hard to win. The player takes on the role of nurse in a cancer care unit and must manage patients’ happiness by bringing them to entertainment rooms, keeping them fed and providing medical care while scrounging for hospital upgrades. 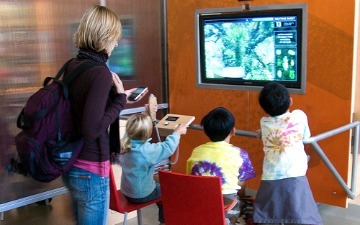 The game was developed with input from three former teen cancer patients. Eye-opening stats on teenagers with cancer in the UK are displayed at the end of every level. “Every day in the UK, six young people aged 13 to 24 are told they have cancer,” reveals one. “That’s about 2,100 a year.” Another points out that one in 312 males and one in 361 females will get cancer before they are 20. You can also learn more about Teenage Cancer Trust, upgrade your ward or proceed to the next level. Teenage Cancer Trust is a charity aimed at caring for youths with cancer. The charity says most teens diagnosed with cancer are placed in kids’ wards or in elderly wards, leaving them isolated. Teenage Cancer Trust builds special wards in hospitals to provide a friendly, effective area for teens to get better together. Funky Nurse promotes the charity to more than 65 million monthly players on gaming site Miniclip. Miniclip has supported the charity since 2009, including free online advertising and fundraising events. Teenage Cancer Trust has 17 units in the UK with another 16 planned for the near future. The organization helps young people fight cancer by also funding clinical and research staff, an education program for schools, family support networks and an annual conference for patients. What do you think of supporting a charity through a video game? And how far did you get? Mashable, 92Y and the UN Foundation present the second annual Social Good Summit. The Social Good Summit unites a dynamic community of global leaders to discuss the power of innovative thinking and technology to solve our greatest challenges. The most innovative technologists, influential minds and passionate activists will come together this September with one shared goal: to unlock the potential of new media and technology to make the world a better place. My vote is still out on this one but it’s an important read, nonetheless. I know there probably are unnecessary tests done in the medical field but I’d hate for people to just stop because of an article like this or generalize to vaccinations, where one could have stemmed off an epidemic. In my opinion, always get a second opinion. New research shows how some common tests and procedures aren’t just expensive, but can do more harm than good. Dr. Stephen Smith, Professor emeritus of family medicine at Brown University School of Medicine, tells his physician not to order a PSA blood test for prostate cancer or an annual electrocardiogram to screen for heart irregularities, since neither test has been shown to save lives. Rather, both tests frequently find innocuous quirks that can lead to a dangerous odyssey of tests and procedures. Dr. Rita Redberg, professor of medicine at the University of California, San Francisco, and editor of the prestigious Archives of Internal Medicine, has no intention of having a screening mammogram even though her 50th birthday has come and gone. That’s the age at which women are advised to get one. But, says Redberg, they detect too many false positives (suspicious spots that turn out, upon biopsy, to be nothing) and tumors that might regress on their own, and there is little if any evidence that they save lives. These physicians are not anti-medicine. They are not trying to save money on their copayments or deductibles. And they are not trying to rein in the nation’s soaring health-care costs, which at $2.7 trillion account for fully one sixth of every dollar spent in the U.S. They are applying to their personal lives a message they have become increasingly vocal about in their roles as biomedical researchers and doctors: more health care often means worse health. “There are many areas of medicine where not testing, not imaging, and not treating actually result in better health outcomes,” Redberg says. In other words, “less is more.” Archives, which is owned by the American Medical Association, has been publishing study after study about tests and treatments that do more harm than good. US scientists say they have “fundamentally transformed” the understanding of the genetics of schizophrenia. A report in the journal Nature Genetics showed that “fresh mutations” in DNA are involved in at least half of schizophrenia cases, when there is no family history of the illness. Researchers found mutations in 40 different genes. They say their findings explain the high number of cases around the world. Schizophrenia is quite common, it affects one in every 100 people during their lifetime. Genes play a part in the illness. A tenth of people with schizophrenia also have a parent with the condition. There’s a story making the rounds on Twitter right now. Engadget “reports” researcher sees security issue with wireless insulin pumps, hackers could cause lethal doses. Wait till you see what researcher and diabetic Jay Radcliffe cooked up for the Black Hat Technical Security Conference. 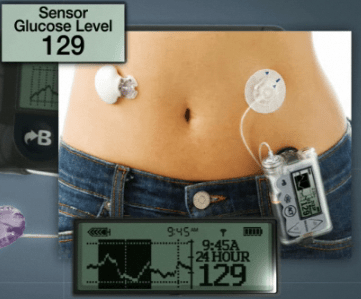 Radcliffe figures an attacker could hack an insulin pump connected to a wireless glucose monitor and deliver lethal doses of the sugar-regulating hormone. First, a little on my background. I’ve been Type 1 diabetic for 17 years. I’ve worn an insulin pump 24 hours a day, 7 days a week for over 11 years and a continuous glucose meter non-stop for over 5 years. I also wrote one of the first portable glucoses management systems for the original PalmPilot over 10 years ago and successfully sold it to a health management company. (Archive.org link) I also interfaced it (albeit with wires) to a number of portable glucose meters, also a first. Engadget’s is a mostly reasonable headline and accurate explanation as they say he “figures an attacker could…” However, Computerworld really goes all out with the scare tactics with Black Hat: Lethal Hack and wireless attack on insulin pumps to kill people. Like something straight out of science fiction, an attacker with a powerful antenna could be up to a half mile away from a victim yet launch a wireless hack to remotely control an insulin pump and potentially kill the victim. The only thing that saves this initial paragraph is “potentially.” The link that is getting the most Tweets is VentureBeat’s “Excuse me while I turn off your insulin pump,” a blog post that is rife with inaccuracies (not to mention a lot of misspellings). Here’s just a few. CT scans of a human brain. Changes to some of the star-shaped brain cells called astrocytes may play a role in depression, a new study finds. The findings are based on the postmortem examination of brains of depressed individuals who committed suicide. The researchers focused on a part of the brain involved in mood regulation and decision making, called the anterior cingulate cortex. In depressed people, some astrocytes were larger and more branched than those of people with no history of psychiatric illness who died suddenly, the researchers said. Games You Didn’t Know Existed to Fight Brain Decline and Aging. Free guide on the warning signs and testing options for Dementia. These differences showed up only in the brains’ white matter, not gray matter. White matter, found deep inside the brain, consists mostly of “cables” that allow different brain areas to communicate. The study adds to a growing body of research linking changes in white matter to depression. It is the first study to “zoom in” and observe changes occurring at a cellular level, said study researcher Naguib Mechawar of McGill University in Quebec. The researchers said they don’t know whether these alterations are a cause or effect of depression and can only speculate on how the changes would contribute to the mood disorder. It’s likely they would affect communication between the anterior cingulate cortex and other parts of the brain, Mechawar added. Astrocytes belong to a group of brain cells known as glial cells. (Glia is Greek for “glue.”) For most of the previous century, glial cells were thought to be minor players in brain activity, providing structural and nutritional support for neurons, which were thought to do the heavy lifting. But recently scientists have come to realize these cells play an important role in brain function, and they have been implicated in diseases such as depression. “They’re not just innocent bystanders,” Mechawar said. Mechawar and colleagues obtained brain samples from 10 people who had committed suicide while suffering depressive episodes, and from 10 other deceased people, which served as a control group. The researchers stained the brain cells so they could distinguish the cells’ individual features. There was virtually no difference in astrocytes in the gray matter of the two groups. However, in the white matter, astrocytes were bigger, and had about twice as many branches, in the people who had committed suicide. Furthermore, the branches were about twice as long. The researchers said the astrocytes may have changed in reaction to a change in their environment – specifically, inflammation in the brain. Chronically high levels of inflammation have been linked to stress and are known to be bad for health. The immune system produces inflammation as a reaction to foreign invaders, but it also can occur independent of infection. Astrocytes are known to swell up when they sense inflammation. The new study adds weight to what is called the neuroinflammatory theory of depression. This theory posits that molecules involved in inflammation play a role in the development of depressive symptoms. Several independent studies have found elevated levels of inflammatory markers in the blood of depressed people. And treatments that include molecules that promote inflammation can induce depressive-like symptoms, the researchers said. If inflammation in the brain is indeed tied to depression, treatment to reduce inflammation may one day help ameliorate the mental condition, Mechawar said. The results were published this week in the journal Neuropsychopharmacology. Pass it on: Astrocytes in the brain’s white matter are abnormal in depressed subjects who have committed suicide. 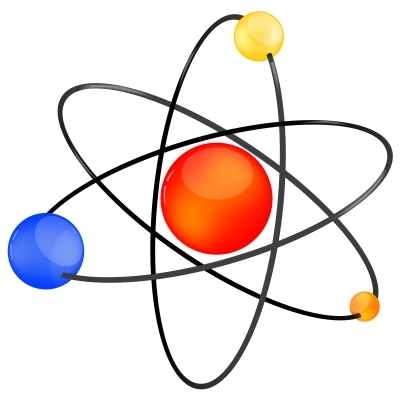 This story was provided by MyHealthNewsDaily, sister site to LiveScience.